As Discovery prepares for Wednesday’s rollover ahead of her mid-February flight (STS-119) to deliver the final set of solar arrays and batteries – the S6 truss – to the International Space Station (ISS), the Program Requirements Control Board (PRCB) has completed the all-important Integrated Launch Site Requirements Review (ILSRR), as well as the Delta Launch Site Requirements Review (DLSRR), for STS-128 – officially confirming the mission’s switch from Atlantis to Discovery. Targeting launch for No Earlier Than (NET) August 6, 2009, Discovery will be prepared for a 13 day, 3 EVA, mission to the ISS that will include the flight of the TriDAR AR&D Sensor Detailed Test Objective (DTO), the next Boundary Layer Transition (BLT) DTO – the first of which will fly on Discovery next month – and the first flight of the OI-34 flight software. The mission was given to Discovery, following the recent changes in the 2009 manifest. Also riding uphill with Discovery will be a new crew member for the ISS – Nicole Stott – as well as MISSE (Materials on International Space Station Experiments) 6A and 6B, SIMPLEX, MAUI, and SEITI. However, the primary payload for Space Shuttle Discovery will be the MPLM (Multi-Purpose Logistics Module) Leonardo – just returned from the highly successful STS-126 mission in November – and the Lightweight Experiment Support Structure Carrier with an Ammonia Tank Assembly. As with all turnaround flows, Space Shuttle Discovery will undergo several modifications once she returns from STS-119, specific mods following the switch of mission baseline from Atlantis. 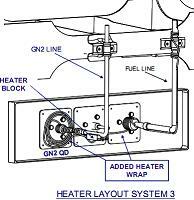 Among these alterations is a mandatory modification to the Auxiliary Power Unit (APU) GN2 Quick Disconnect (QD) heater on system 3. “Completion of (modification) – adds heaters to APU GN2 QDs to mitigate the most likely cause of GN2 system pressure decay observed on previous flights,” notes the updated PRCB document, available for download on L2. Engineers believe that raising the temperature of the GN2 QD will mitigate the potential for leaks and pressures decays that have been seen on two previous flights: STS-121 (Discovery) and STS-123 (Endeavour). Heaters have already been added to GN2 systems 1 and 2 during Discovery’s flow for STS-119. All equipment necessary to perform this task is in stock in the logistics facility. Another modification for Discovery is the installation of TriDAR. “The TriDAR sensor will be installed on the Orbiter to demonstrate technology for autonomous rendezvous and docking in low earth orbit,” notes the PRCB. 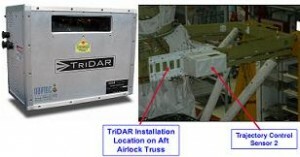 TriDAR will be mounted to Discovery’s external airlock truss in the location of Trajectory Control Sensor 1 – which is no longer flown. In addition to these modifications, the PRCB heard recommendations to demanifest the Port Tool Stowage Assembly for weight reductions purposes and to change the configuration of the Remote Manipulator System End Effector to integrate hardware upgrades that have been in work since STS-103 in December 1999. Also on tap for Discovery are several potential modifications that will be manifested and baselined if the opportunity or priority arises. These modifications include an ET door Teflon seal design change, a redesign of the Rudder Speed Break Thermal Clips, an enhancement to the Tyvek covers for the Reaction Control System jets, Wing Leading Edge Spar “Sneak Flow” protection on RCC panels 2-4 on both wings, a redesign of the lower Wing Leading Edge CP Horse Collar Gap Fillers on RCC panels 2-4 on both wings, a connector saver redesign for the left hand OMS Pod and Ku Band antenna, and the second Boundary Layer Transition (BLT). 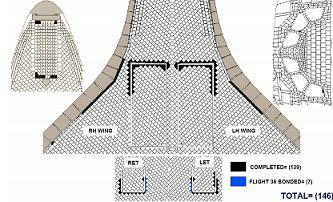 For the BLT, the PRCB notes that STS-119 next month “will fly with a protuberance height of 0.25 inches to initiate BLT at ~Mach 15.” To ensure that the most information is gleaned from this test, thirteen thermocouples have been installed into Discovery’s Thermal Protection System tiles. Originally the DTO was to debut with Endeavour on STS-126. 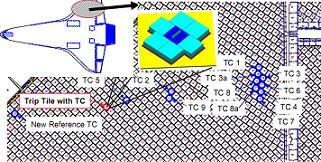 Of these thirteen sensors, eleven were placed in downstream tiles that will be in the direct path of the transitional cone of influence; one was placed in the protuberance tile itself; and one was placed in a tile upstream of the protuberance to collect reference data. The final decision on whether to include the second BLT DTO on STS-128 will be taken after engineers can evaluate the data from STS-119 – which is flying with a protuberance of 0.25 inches – as well as data from Arc Jet testing. If the decision is made to proceed with the second test, Discovery would likely fly with a protuberance in the range of 0.35 inches to 0.45 inches on STS-128. In addition to this work, engineers will continue the installation of BRI (Boeing Reinforced Insulation) tiles around critical areas of the vehicle. To date, 146 BRI tiles have already been bonded to Discovery. Furthermore, Discovery will have her right hand OMS Pod removed to allow for Attach Point 2 retorque and Fuel Cell-3 will be replaced due to end of life limits. Also in support of the mission, the Shuttle Data Tape and Mass Memory Unit are scheduled to arrive at the Kennedy Space Center on January 20 and February 9, respectively. As part of the detailed review of any possible issues that could be experienced with flight hardware and equipment, the Payload Cargo Engineering Team has identified five areas of Cargo Close Clearance. The PRCB presentation goes on to note that measurements of some of the close clearance points will be taken at the appropriate times once the payload has been installed into Discovery’s Payload Bay at the launch pad. However, the ATA measurements will be taken digitally prior to payload installation given the ATA’s location on the Lightweight Experiment Support Structure Carrier and the Carrier’s location in the Payload Bay. Measurements for the MPLM to top centerline latches and ASI flag to sidewall are either already on file or those areas are inaccessible once payload installation is complete. Additionally, as with all missions, the PRCB has thoroughly examined Discovery’s weight in terms of Ascent Performance Margin (APM) and nominal and contingency landings. For STS-128, all predicted weights are well within the margins set by the Space Shuttle Program guidelines.